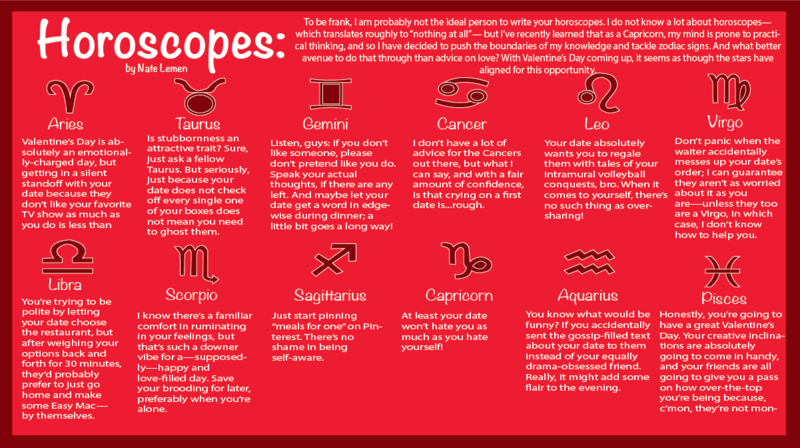 To be frank, I am probably not the ideal person to write your horoscopes. I do not know a lot about horoscopes — which translates roughly to “nothing at all” — but I’ve recently learned that as a Capricorn, my mind is prone to practical thinking, and so I have decided to push the boundaries of my knowledge and tackle zodiac signs. And what better avenue to do that through than advice on love? With Valentine’s Day coming up, it seems as though the stars have aligned for this opportunity. Valentine’s Day is absolutely an emotionally-charged day, but getting in a silent standoff with your date because they don’t like your favorite TV show as much as you do is less than ideal. Is stubbornness an attractive trait? Sure, just ask a fellow Taurus. But seriously, just because your date does not check off every single one of your boxes does not mean you need to ghost them. Listen, people: if you don’t like someone, please don’t pretend like you do. Speak your actual thoughts, if there are any left. And maybe let your date get a word in edgewise during dinner; a little bit goes a long way! I don’t have a lot of advice for the Cancers out there, but what I can say with a fair amount of confidence is that crying on a first date is… rough. Your date absolutely wants you to regale them with tales of your intramural volleyball conquests, bro. When it comes to yourself, there’s no such thing as oversharing! Don’t panic when the waiter accidentally messes up your date’s order; I can guarantee they aren’t as worried about it as you are — unless they too are a Virgo, in which case, I don’t know how to help you. I know you’re trying to be polite by letting your date choose the restaurant that you know they’ll like, but you’ve got to make a decision eventually. After weighing your options back and forth for 30 minutes, they’d probably prefer to just go home and make some Easy Mac — by themselves. I know there’s a familiar comfort in ruminating in your feelings, but that’s such a downer vibe for a — supposedly — happy and love-filled day. Save your brooding for later, preferably when you’re alone. Just start pinning “meals for one” on Pinterest. There’s no shame in being self-aware. At least your date won’t hate you as much as you hate yourself! You know what would be funny? If you accidentally sent the gossip-filled text about your date to them instead of your equally drama-obsessed friend. Really, it might add some flair to the evening. Honestly, you’re going to have a great Valentine’s Day. Your creative inclinations are absolutely going to come in handy, and your friends are all going to give you a pass on how over-the-top you’re being because, c’mon, they’re not monsters.